Stay sustainable, eat organic for cheap and grow your own food in the Big Smoke. Most people probably don’t appreciate bees as much as they should. Sure, people like honey, but otherwise probably consider bees a stinging nuisance. Au contraire! Bees are of vital importance to humans and the food we all love to consume. Without their help, almost 30% of the food we eat would not exist1. You see, crops that we harvest for food products need to be pollinated in order to successfully produce fruit. Without this pollination, you can say goodbye to strawberries, tomatoes, apples and even almonds, among others. Well, big deal, you think, this just sounds like a futuristic, dystopian future, right? Not quite. Bee populations have been steadily declining for years. It is estimated that the number of bee colonies in the UK has fallen by 53% between 1985 and 20053. There are several factors which have contributed to a decline in pollinators across the globe. Bees have been affected by diseases caused by parasites which have come from imported bees. Loss of natural habitat has had devastating consequences, as well as drastic weather patterns witnessed in the last few years, where winters have been harsh and springs have been cold. These conditions are hard for bees to deal with. Recently, a phenomenon called Colony Collapse Disorder (CCD) has been witnessed in the USA where entire colonies die out 4. The cause for this is unknown, however there are theories that suggest that genetically modified crops may be the cause. Pollution, especially for urban population of bees, has also been attributed to the decline in bee numbers. This is particularly a problem in places like China, where bee populations are so low that flowers have to be pollinated by hand. A devastating habit that humans have is the use of pesticides. The chemicals used in pesticides have a devastating effect on bees and have been one of the main factors in the decline of bee populations globally. 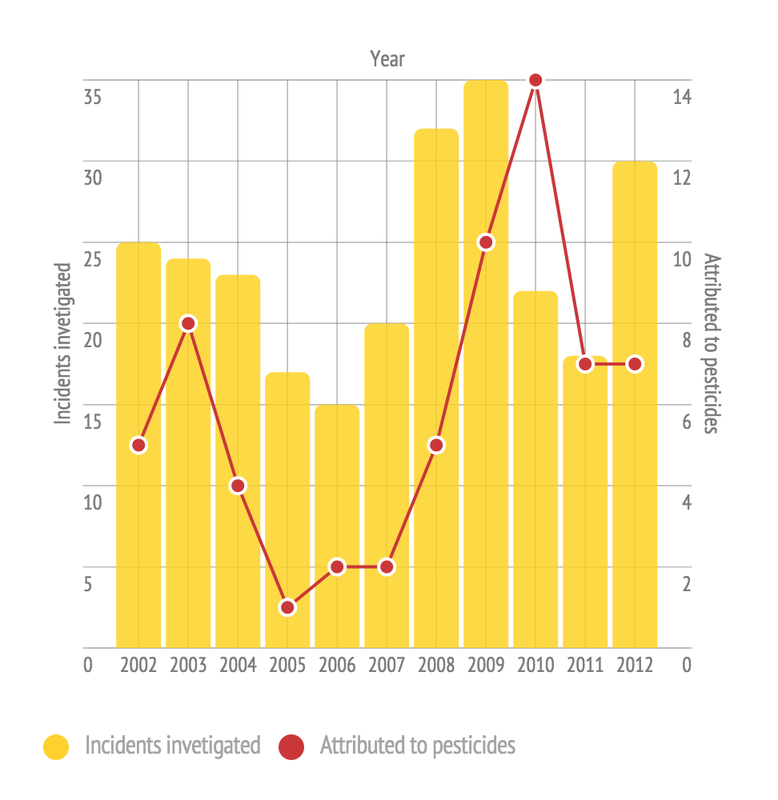 This graph shows the number of incidents (unexplained deaths of bees) investigated in the UK and how many of those incidents were attributed to pesticide use. Although it may seem like pesticides don’t cause all the problems, it’s important to remember the data above is based only on information which was voluntarily submitted by beekeepers, so actual numbers could very much different. As outlined earlier, bee population declines have been attributed to several factors, but pesticides remain a very destructive reality. Thankfully, as they are created and used by humans, we can at least try our best to control how we use and manufacture them. In 2013 the EU banned a number of pesticides shown to be particularly harmful to bees 6. Hopefully in the coming years, the ban will have a favourable effect on bee populations. 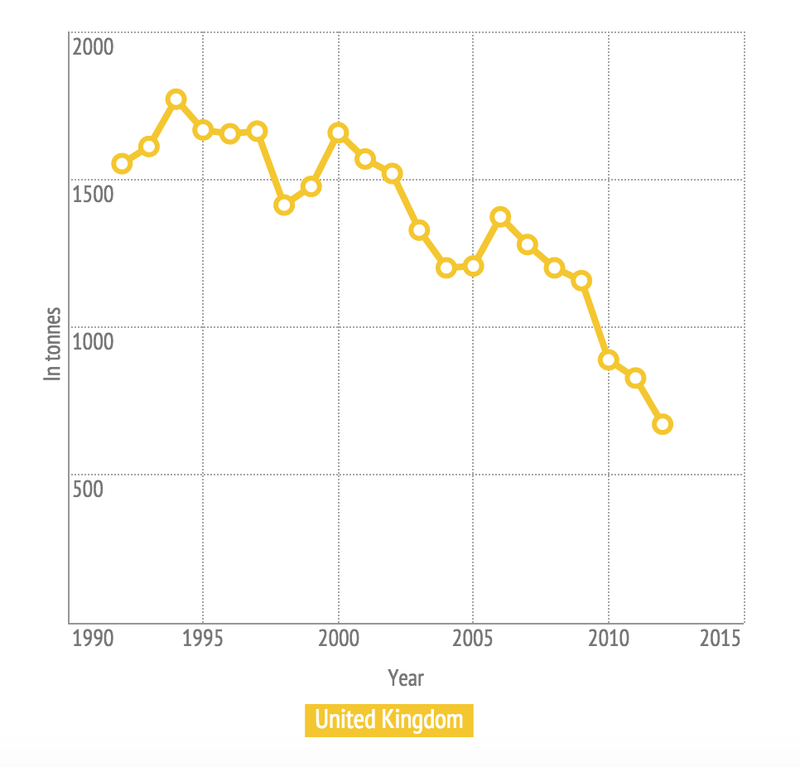 As the graph below shows, the use of pesticides in the UK has been steadily decreasing in the last decade. If this trend continues, perhaps bee populations will level off and maybe even increase. The pesticide ban is a step in the right direction, but the problem of declining bee populations is still very real. The good news is everyone can do their bit! The simplest way is to plant certain types of flowers in your garden which bees love. The Royal Horticultural Society has created a handy list of plants and flowers favoured by pollinators or check out this interactive guide by the Bumblebee Conservation Trust, which help you identify which plants in your garden are bee-friendly. Alternatively, you can become a beekeeper! The British Beekeepers’ Association is the perfect place to start if you’re thinking of keeping hives. And if you come across a bee that is crawling about, looking weak, you can help them. Go here to learn how to revive a tired bee. Throwing a few seeds around your garden takes seconds, so let’s all try to do our bit to help out the bees. We love our food, so we need to love our bees! 10 Urban Farms to follow on Twitter!